Much of the most innovative and exciting cinema on screens today comes out of the universe of genre films – movies that are entertaining, surprising and sometimes shocking. Fantastic films that upend conventional limitations to help us escape reality and harbor deeper ambitions to thrill smart audiences. What The Fest!? is for the creative and curious looking for a community in which to share experiences and have a blast together. From cerebral shockers to singular cinematic experiences to unforgettable special events, What The Fest!? is more than just movies, it is an experience. What The Fest!? 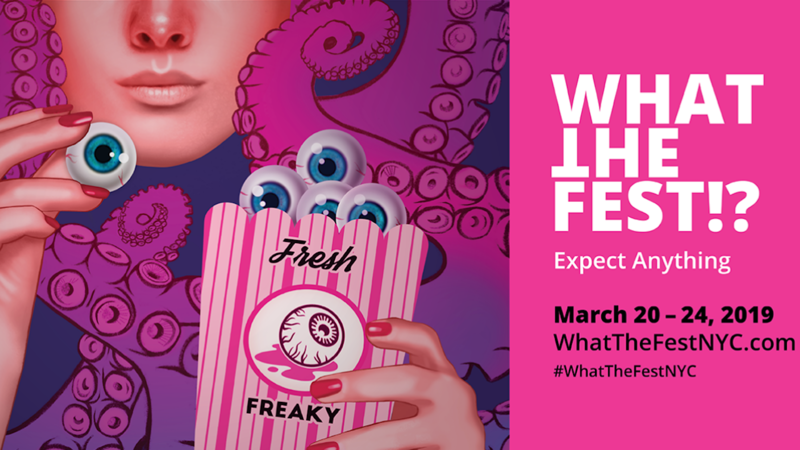 is a five-day event taking place March 20 – 24, 2019 at the IFC Center, bringing new genre films to the big screen in the heart of Manhattan. Showcasing a small range of carefully selected films from the wild side of cinema with guests and special events to highlight the films in a new way, it is the weekend not to miss for cinema lovers who are looking for the next cool thing.